Because we’re turning three we’ve been giving away notebooks and pens to celebrate—one writer’s notebook and pen to giveaway each day for three days (today is the last day but check out Monday’s and Tuesday’s posts because you still have until Friday to enter.). Here’s today’s notebook and pen giveaway. One spiral bound notebook and a blue pen. 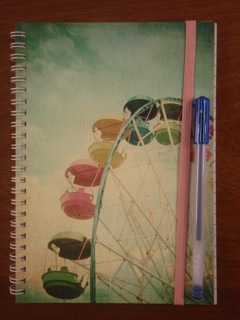 A spiral-bound notebook with elastic attached to hold it closed. Plus blue pen. If you’d like to enter today’s notebook-and-pen-giveaway, there is one step. Note: this is a random draw and we will put all the entrants’ names in a hat and draw out the winner. We are only able to post the prize to Australian addresses. You are welcome to enter if you live overseas but you will need to nominate a lucky friend or relative in Australia to receive the prize. We will announce the winner on the blog on Saturday 22 October. We will ask that the winner emails us an address where we can post the prize. If we do not hear back from the winner by 28 October, we will award the notebook to the runner-up of the competition. No correspondence will be entered into regarding the winner. Our decision is final. My daughter has been loving Goosebumps this year. She said she can’t pick just one favorite out of them.. so all of the goosebumps are her fave. Flood by Jackie French. Stirring for its raw honesty and poignancy. Uplifting because it subtly and beautifully reinforces the strength of hope, kindness and human cooperation. Memorable because Bruce Whatley’s illustrations allow you to almost feel, taste and hear the never ending rains. He giggled and giggled and giggled some more and repeatedly read it over and over again for more giggles. I love to see children excited about reading books even if it might be about poo! Loving ‘The Truth about verity Sparks’ by Susan Green- the humour yet pathos of Verity’s situation makes it a great read aloud to share with my grandson. Sharing books that I’ve enjoyed is a passion. Charlie and the Chocolate Factory by Roald Dahl. I wanted to read this after seeing the movie. I loved reading this book as it made me feel like I was there with Charlie. My son’s reading has really taken off this year & he’s really loving the Magic Treehouse series and has read five various books so far. My other son has been enjoying the Warriors series too. I absolutely love The Simple Things by my husband Bill Condon which I’ve read in manuscript form. It’s being published next year by Allen & Unwin and I have no doubt that this junior novel will win major awards. It’s a simple but very moving story about a young boy who is on holidays with his parents at his great-aunt’s place. The relationships are all beautifully realised and you feel as though you want to keep following the boy forever, he is so innocent and sweet.